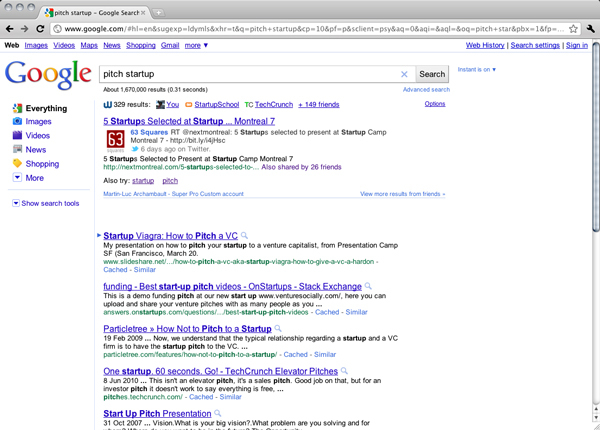 In January Montreal-based Wajam  launched a beta version of its ‘social search’ browser extension that works in Google, Bing and Yahoo. Wajam adds a layer of results, above the usual search engine results, where users can find content that their friends have shared on social networks like Facebook and Twitter. 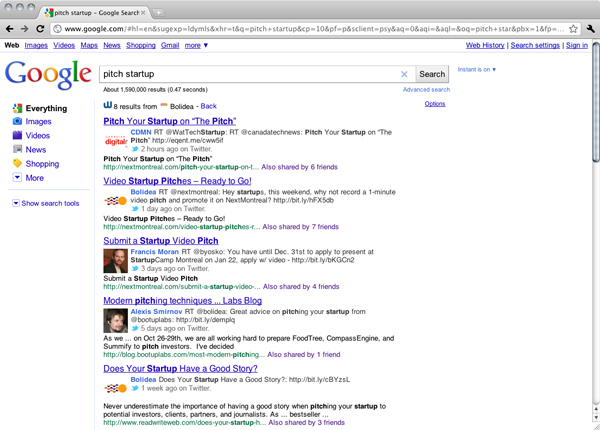 Users can also search for their personal browser bookmarks and those from Delicious. Funded by startup lab and accelerator Bolidea , Wajam is compatible with major browsers like Internet Explorer, Firefox, Chrome and Safari, and works on PC and Mac. 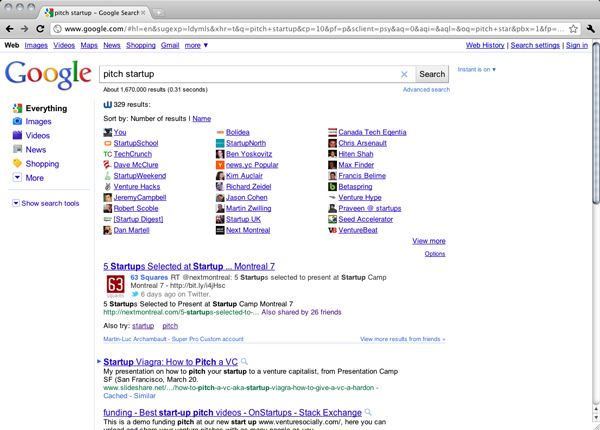 The company plans to add more social network sources to the service and support more search engines in the near future. “Wajam wants to bring your friends’ knowledge with you anywhere that you search online. The future goes beyond search engines,” said Olivier Cabanes, partner, Bolidea. 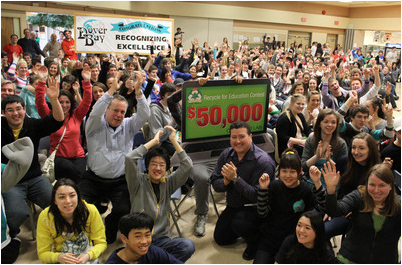 For the first time ever, Staples Canada  has awarded a computer lab valued at $50,000 to Dover Bay Secondary School in Nanaimo, BC, for eco-responsible improvements made within their school, community and families. Canadian students were invited to enter the contest  by writing a 500-word or less online essay about the actions they took to help their school and community become more eco-responsible. Jobdeals, Inc.  has launched its powerful online local services search product in Canada, focusing initially on serving the Greater Toronto Area, but its Canadian service provider database is growing and Jobdeals will expand nationally in the near future. Jobdeals enables consumers to find and book appointments online with local service providers. It goes beyond previous local search attempts by allowing consumers to receive multiple price quotes and schedule appointments with local businesses and freelancers all in one place – and the company is currently running a free promo for service providers, and consumers always book jobs free. ecobee , the award-winning green technology company, today expanded its mobile offerings with the release of a free Android app  for the ecobee Smart Thermostat. Downloadable from the Android Market, the ecobee Android app will allow customers to control their ecobee Smart Thermostats anytime, anywhere from the convenience of their Android devices. ecobee also offers a free iPhone app  which has proven immensely popular with tens of thousands of downloads to date. Toyota Canada  has embraced the social media movement, launching a brand new Facebook page , plus an enhanced twitter feed  and YouTube channel , and invites these customers and enthusiasts to share their passion and stories by joining the conversation. The online conversation kicks off with a new contest to find Toyota’s #1 Fan.